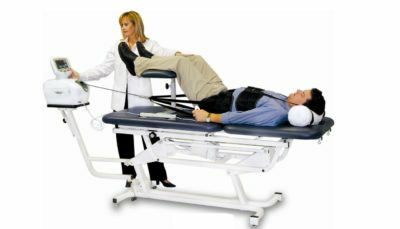 Spinal Decompression Therapy is a revolutionary type of motorized traction that gently stretches either the neck or low back in a precise and graduated manner. This takes pressure off the spinal discs (the gel-like cushions between the bones in your spine) by creating negative pressure in the disc. As a result, bulging or herniated discs retract, taking pressure off nerves and other structures in your spine. The cycles of decompression and relaxation, over a series of visits, promote the diffusion of water, oxygen and nutrient rich fluids from the outside of the discs to the inside. These nutrients enable the torn and degenerated disc fibers to begin healing themselves. This treatment is a great option for patients suffering from bulging discs, herniated discs, pinched nerves, sciatica, radiating arm pain and who may be considering surgery.